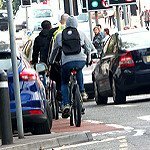 Sharp eyed cycle campaign members will have noticed the new Bristol Transport Strategy (BTS), published at the end of September and out for consultation until 2 November 2018. The BTS is Bristol Council’s blueprint for defeating congestion, air pollution etc for the next 18 years; until 2036. If you were hoping for better cycling conditions than these people near the BRI, you may be waiting a while longer. The BTS is a curious mixture. In general terms it’s extremely ambitious; an underground with three lines is contemplated as are other Mass Rapid Transit (MRT) routes. The problem is MRT will take decades, if not generations, and billions to complete; there is a real risk (likelihood?) it won’t happen at all, or certainly to the extent contemplated. In the meanwhile and certainly in the next 5 to 10 years very little will change. Certainly it’s a recipe for things getting worse before, and even if, they get better. Ambitiously a workplace parking levy and congestion charge are put forward but, oddly, only to fund public transport not cycling or walking. And people will pay the levy for years, (a decade? 13 years for Metrobus), before they see any benefit; is that politically achievable? The cycling proposals are disappointingly weak and unspecific. Lots of nice words and vague ambition but no clear actions. Our view is this was a missed opportunity. At peak times Central Bristol will continue to be a slow moving car park. Residential streets will still be dominated by many, too large motor vehicles. Even if there is the money and political will to implement MRT schemes it will be the middle, probably second half, of this century before anything big changes; can we really afford to wait that long? A proper safe segregated cycling infrastructure network could be built for less than it took to build Metrobus (£240m). Together with walking measures and low traffic neighbourhoods that could transform Bristol in 10 years. It’s not a magic bullet (neither is MRT) but it is a cheap, quick part solution. More optimistically a Local Cycling and Walking Infrastructure Plan is in preparation, and we are already influencing that. A Cycling Strategy is promised and we will engage with that too.